RUSSIANS MAY HAVE SUNK THE AMERICAN SUBMARINE, U.S.S. THRESHER IN 1963 USING HAARP-TYPE PARTICLE BEAM WEAPONS! Title: RUSSIANS MAY HAVE SUNK THE AMERICAN SUBMARINE, U.S.S. THRESHER IN 1963 USING HAARP-TYPE PARTICLE BEAM WEAPONS! Subtitle: We all have apparently been lied to since 1963 about the "invulnerability" of our atomic submarines. Tesla's technology to produce beam pulse Electro-Magnetic weapons were first used to sink the USS Thresher by the Soviets in 1963. We have noted the skepticism encountered when we talk about the fact that Tesla's early 1900's technology regarding pulse-beam weaponry has been perfected, allowing scientists of both America and Russia to control the weather, even to the point of using weather as a weapon. Similar skepticism pours forth when we speak of lethal particle beam weapons that can destroy entire fleets of missiles, airplanes, and ships, or annihilate an entire army in seconds. We really encountered skepticism when we say that this HAARP technology can also control the minds of people from thousands of miles away. * In 1492, Christopher Columbus discovered he was going to have great difficulty persuading the Queen of Spain that the world was not flat. Further, Columbus found it very difficult to recruit sailors once he persuaded the Queen because everyone just "knew" that the flat world had an abrupt edge to it, at which point man, beast and ship would plunge into an abyss to who-knows-where? History changed dramatically because one man dared stand up to challenge the "prevailing wisdom". * In the early 1900's, when many inventors were trying to figure out how to fly heavier-than-air machines, the prevailing "wisdom" among the people was that "if God had wanted man to fly, he would have created him with wings". Fortunately, the Wright Brothers did not believe that bilge anymore than Columbus believed the bilge that the earth was flat. Our world changed rather dramatically following the successful Wright Brothers experiments. In the modern world following World War II, the Mass Media became increasingly effective in hiding many truths from the American people. Americans today still have trouble believing scientists can control the weather, and even fewer understand that our weapons technology has made such great strides that today's weapons systems in the air, on the ground, and in the ocean are largely obsolete. They are, in fact, sitting ducks for the time when a true enemy begins firing these pulsed beam particle weapons at them. "Nikola Tesla also planned a very special use for his endothermic scalar interferometer. He planned to produce what he called his 'big eye to see at a distance.' This is accomplished as shown on the diagram ... the beams are 'scanned' by an open receiver, timewise, from side to side and top to bottom. By scanning yet another single beam through the intersection zone and phasing its pulses, an even better representation can be obtained. Thus the receiver produces a representation of the energy extracted from various locations within the distant endothermic zone. By displaying the received signals on an appropriately scanned screen, a representation of the distant scene in the intersection zone can be created. Indeed this is a special kind of 'microwave interferometry,' and -- with modern techniques -- the imagery obtained might be surprisingly good. With development, it might even become as good as the image presently obtained by side-looking acquisition radars." "Interestingly enough, since scalar EM beams will easily penetrate the earth or the ocean, one can also look beneath the earth or beneath the ocean with this type of scanning scalar interferometer. The importance of this capability to strategic and tactical reconnaissance is obvious. Camouflage, cover, and concealment have no effect on such a system. One can easily look inside buildings and into underground facilities ..."
"It requires little imagination to see that this system is easily adapted to produce an "underwater radar." With such devices, the problem posed by the underwater nuclear submarine is solved. For example, an entire area can be continually searched, much like acquisition radar systems do now. A submarine can be detected and tracked, and none of its ordinary detectors will detect anything out of the ordinary. By using a separate pair of beams in the exothermic mode, powerful scalar pulses can be fired at the distant sub, intersecting at the submarine in a violent EMP throughout the sub and its armament. Thus the sub and all its missiles are destroyed instantly." Since this technology exists, and is effective, why has our Government continued to spend hundreds of billions of dollars to produce submarines that are literally sitting ducks to this technology? Why do we continue to put the lives of our precious sons and daughters who are serving on these subs? And, finally, why have we been lied to and told that submarines are invisible and virtually undetectable? I remember well the furor caused about 10 years ago when a Japanese manufacturer sold equipment to the Soviets that would enable their submarines to run so silent American ships would have trouble detecting them. We were so angry with the Japanese we instituted some economic penalties against them for a while to "punish" them for their transgression. In fact, I believe this incident spawned the popular novel and movie, "Hunt For Red October", written by Tom Clancy. This movie depicts a Soviet technological advance over the Americans in producing a nuclear submarine that could run so silent as to be virtually undetectable by even the best American listening devices. The submarine was nearly as undetectable as it was created to be, and did almost get into position off the American coast where it could launch nuclear missiles from right off our shore. However, this movie conditioned us to believe a lie. Little did we know that both Americans and Russians possessed particle beam weapons that rendered submarines totally naked and vulnerable. In fact, this technology was not created in the mid-1980's when "Hunt For Red October" was filmed; it was created and in place in mid-1963! In the above scenario, Lt. Col. Beardon discusses how two (2) particle beam weapons -- "scalar EM beams" -- can intersect at the point of a submerged submarine, destroying it quite effectively and violently. Listen again to Lt. Col. Beardon as he discusses another way in which to destroy a submarine. "... continuous exothermic transmission can be used by the targeting weapon at lesser power, gradually interfering with the sub's electrical systems and causing it to lose control. The sub then sinks to crush depth and implodes. Precisely that scenario seems to be what happened on April 10, 1963, to the U.S.S. Thresher nuclear submarine. It left a signature: the sub's surface companion, the nearby U.S.S. 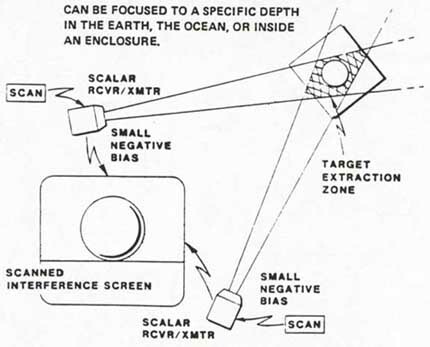 Skylark, was in the "splatter zone" of the underwater scalar interference. That is, spurious EM noise was being generated in all the Skylark's electrical systems, some of which were actually disabled. So intense was the "electronic jamming" that it required over an hour and a half for the Skylark to transmit an emergency message back to its headquarters that the Thresher was in serious trouble and contact with it had been lost. Some of the Skylark's communication systems actually failed, but later resumed operation inexplicably, once the jamming was gone. That type of "jamming" of multiple bands and multiple electronic equipments, of course, together with the anomalous failure of electronic equipment and its later mysterious recovery, were direct signatures of the use of the exothermic scalar interferometer against the undersea target area in the vicinity of the Skylark." I well remember the loss of the USS Thresher. It was one of our newest nuclear submarines, the pride of the fleet as I remember. We were just beginning the build-up of our "invincible" submarine capability. This loss spread enough shockwaves throughout the American public as it was; can you imagine the absolute panic had the American people understood that the Soviets possessed a "super-beam weapon" that could locate and destroy any submarine in all the world-wide oceans? We were still smarting with self-doubt from the fact that the Soviets had beaten us into space with their Sputnik. Therefore, our Government chose to lie to us, assuring us that the USS Thresher had just sunk because of an "accident" at sea. We were reassured that the rest of our fleet was fine, and not to worry. But, now we discover that the USS Thresher was lost because it was hit with a "lesser" powerful EM particle beam weapon that caused it to just lose control and sink! Then, to add insult to injury, Lt. Col. Beardon tells us that the Soviets next tested the first declared capability of this EM particle beam weapon to violently destroy a submerged submarine. "The very next day, Apr. 11, 1963, the same Soviet scalar EM howitzer system was tested in the "destroy submarine" pulse mode. A huge underwater EM blast occurred off the coast of Puerto Rico, about 100 miles north of the island. The underwater explosion caused a huge boiling of the surface of the ocean, followed by the rising up of a giant mushroom of water about a third of a mile high. The mushroom of water then fell back into the ocean, completing the signature." This effects of this test were observed by a very startled crew of a U.S. jetliner that just happened to be passing over the area of the Soviet test. The practical ramifications of this entire incident in April, 1963, are enormous. First, as early as 1963, both Soviets and Americans possessed particle beam technology that made most conventional weapons obsolete. Yet, both America and Russia continued to build just such obsolete airplanes, ships, submarines, and ground forces. The reason for this is quite clear: the Illuminati felt it needed the focus and the effort such a military build-up of obsolete weaponry provided. The Dialectic Process called for a long period of a "Cold War" in which Thesis [Western Powers] and Antithesis [Communism] "battled" each other without destroying the other, so the end result of the Synthesis system [New World Order] could be established. The Report From Iron Mountain also made it quite clear that the Illuminati considered a national effort at defense or an open-ended Space Program to be quite useful in organizing and controlling the masses even while their ultimate destruction and enslavement was drawing nearer. Our point is that a global script began at this time in world history and has not stopped yet. The scripted play is incredibly sophisticated and controlled by supernatural Guiding Spirits serving Lucifer. But, scripted they are, and you need to thoroughly understand this fact. Thirdly, what was the real purpose of the "Hunt For Red October", if our top military and civilian leadership knew all along that submarines are obsolete sitting ducks? Remember that all of Hollywood exists simply and only to condition the masses so that they can be manipulated into accepting the horrors of the coming global Kingdom of Antichrist. I believe it likely that the purpose of this movie was to hide from our eyes the fact that particle beam technology exists and is terribly effective. At all costs, the Illuminati wants to hide the existence of particle beam technology from you and I, because they are right now using it against us, to enslave us, and the less we know of the weaponry being aimed right at us, the more likely we are to be conquered. Now, we invite you to examine the diagram, above, of how this EM particle beam weapon works. This weaponry principle can be set on any platform, i.e., airplane, ship at sea, land-based station, and probably satellite. It can bombard its target with either beams that will destroy it outright, or by beams of lesser strength that would disable the target's electronics and cause it to go out of control. If the target is an airplane, the lesser strength beam would cause it to lose altitude and crash; if the target is a submarine, the lesser beam would cause its electronics to malfunction to the point of causing it to lose control and sink, just as the USS Thresher did on April 10, 1963. With this capability in aircraft in mind, let us now turn to the latest book on HAARP beam technology from Dr. Nick Begich, "Earth Rising: The Revolution. Towards A Thousand Years of Peace". Dr. Begich is describing the capabilities of HAARP-type beam weaponry, and the surprising vulnerability of certain modern, state-of-the-art aircraft. Now, let me get this straight. Today's American military possesses the HAARP-type EMP weaponry to disable the electronics of the latest Airbus and Boeing commercial aircraft!! They can use either a strong beam which would knock the plane out of the sky, or they could use the lesser beam that would simply destroy the electronic control systems so the plane would lose control and seemingly fall out of the sky for "mysterious" reasons! With this knowledge in mind, I think we need to look at certain aircraft disasters of recent memory, especially the Egypt Air 990 flight. I believe this was a very late-model Boeing aircraft, as well. But, that is the stuff of another story. One final note is worthy of mentioning. Earlier, in discussing the fact that American leaders secretly consider both the Russians and Chinese as co-conspirators in the implementation of the New World Order Plan, we said that Presidents from Eisenhower to Clinton have secretly considered these leaders to be friends. Since this is the case, against whom are we building our sophisticated weapons systems? Whom does the Illuminati consider their enemy? * They consider their enemy to be excess population in the world, which is why they plan to annihilate two-thirds of them soon after the Antichrist arises. * Illuminists consider American Industrial Civilization to be an enemy. * Illuminists consider Christians to be an enemy. * Illuminists consider the current system of Representative Democracy to be their enemy. No one could have possibly defined the Illuminati in a better manner. We are in the end of the End Times.